Almost 20 people, mostly women and a few men, crowded into TrueCar‘s conference room. Many thanks to Chris Lichti who responded to a last minute text message and Jeremy who stayed late at the office. Thanks also to Nike for supplying food & drink, Women Who Code who got the word out, connected us to Nike and helped with last minute logistics. 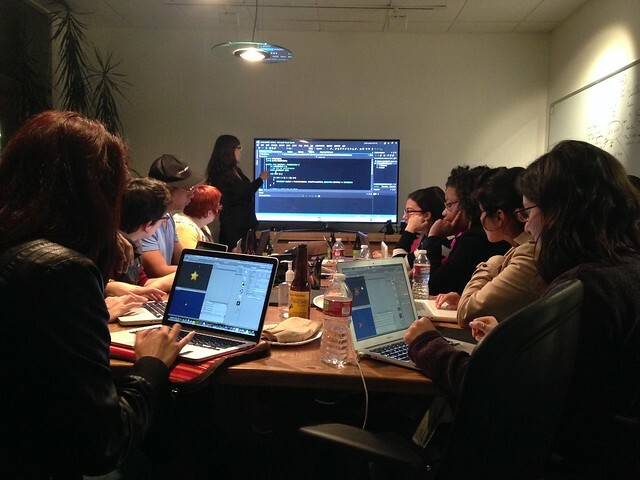 Phoenix Perry from the Code Liberation Foundation taught a hands-on workshop in 2d game programming with Unity. It was great to have an event where experienced programmers could dive in and learn a new environment and programming language — everyone had coded before, but most were new to C#. At the beginning of her talk, Phoenix reviewed the history of computer programming — from a field that was almost exclusively female to the strange shift to the male-dominated industry we see today. Almost half of gamers are women, and I’m excited about what Code Liberation is doing to bring more women into the exciting world of game development. Normally they teach a series of classes in C++ and open frameworks, and graduates have gone on to develop and publish games. How did we bring this exciting new movement to San Francisco? These kinds of simple, yet powerful teaching events do not need months of planning or complex logistics — just like Women Who Code, RailsBridge, ClojureBridge, PyLadies, or any of the other grassroots coding communities, we can make this happen in any major city and in quite a few smaller locales that have a few passionate coders willing to teach. I’m delighted to share the simple and powerful story about how the community came together to support the Code Liberation crew and made this happen. Sarah, Phoenix runs an organization, The Code Liberation Foundation (http://codeliberation.org) to teach women to program games for free… They are in SF this week at the Game Developer Conference and Phoenix is speaking. However, despite the fact that only 4% of game developers are women, they refused their proposal to teach a free workshop for minority voices in games. Persistent, they are still looking for a place where they can run a free workshop. Do you know anyone in SF who might host them? What kind of person travels across the country to speak at a conference and instead of just going to the parties after a long day at the conference volunteers to teach a group of strangers a new coding skill for free? I do that. So does Desi, Mary, Renee, Sarah and so many other people who have spread RailsBridge far and wide. And here’s someone who wants to come to our town and teach the skills that she knows. How could I say no? It was heart-warming how the community came together. I decided to reach out to Women Who Code whose thriving community has a lot of experienced developers who write code for all kinds of platforms. Alaina Percival’s quick response was simply to create a meetup event and make me the host so I could fill out the details. There were all sorts of shenanigans in getting the event to happen, as you might expect when you plan an event in 4 days with a loose collection of people communicating via email, twitter, and text messages. With community support, we can be resilient and move fast. Were you sorry you missed the event? Would you like to see one like it happen again? All the code and teaching materials are on github. I’ll bet Pheonix would be up for a remote teacher training, and we may have some would-be teachers lurking… or could it be you? ← Galvanize picks RailsBridge for Vail Ski Challenge!